The Cannoli Mystique: Are You A Tifosi? Now, this may sound crazy, but here's where I think adding chocolate chips makes sense, mostly because they temper the cloying sweetness and add some much-needed texture. Otherwise, you just have mouthful after mouthful of clumps of cream and shards of shell. The Accidental Locavore needs a cannoli re-education. There's something lacking in my makeup that recognizes the true goodness of cannoli. Hearing people raving about them, one always thinks one is going to be biting into pure nirvana -- and it never happens! Now, your first reaction is probably "that's because you've never had a good one" or "that's because you've never had one from____ ." Well, according to people who I think know a good cannolo (singular of cannoli), I have had good ones, and ones made fresh from Italian bakeries of renown. And they still leave me shaking my head in disappointment. OK, so it's probably prejudice. For me, French baking has it all over Italian baking. From bread to pastries, I'm going to pick France over Italy any day. There are a lot of other food and drink areas where the Italians definitely give the French a run for their money, or exceed, but not when it comes to baked goods. Other than cannoli, what's the first Italian pastry that comes to mind? See what I mean? A cannoli is a pretty simple concept; a deep fried cookie tube filled with sweetened ricotta. And like many seemingly simple things, difficult to execute properly. First, the tubes are never very good. There's just no finesse to them. Thick, boring and almost flavorless they're really just a vehicle for transporting the ricotta filling to your mouth. A spoon would work better. And the tradition of topping them with powdered sugar is pretty but adds unnecessary sugariness. Then, the ricotta filling is always too sweet (this was the issue with the ricotta ice cream I made this summer). Now, this may sound crazy, but here's where I think adding chocolate chips makes sense, mostly because they temper the cloying sweetness and add some much-needed texture. Otherwise, you just have mouthful after mouthful of clumps of cream and shards of shell. You're probably wondering what set me off on this anti-cannoli rant. I was in the butcher's upstate and was offered a mini cannolo, while my order was being wrapped up. I took it, ate it and tried to be appreciative of its cinnamon-dusted shell. In the car on the way home, recovering from the staggering sweetness I started wondering why people get all excited by this particular treat. What are your thoughts? 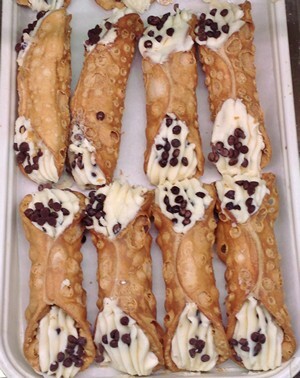 Are you one of the cannoli tifosi?